The terms "46 and having a baby" don't need to be mutually exclusive. While the likelihood of getting pregnant does decrease as a woman gets older, it doesn't mean that women in their mid-forties necessarily need to give up the idea that they will be able to carry a child. Some women put off starting a family due to career issues. If they have spent several years in university preparing for a career, they may have decided to focus on getting established in their chosen career before becoming pregnant. For others, the decision not to have children may have more to do with their relationship status. No matter what the underlying reason, there are plenty of good reasons to delay having children. Women who wait to have children may be more educated and settled in their careers than younger mothers. Mature parents may also have more financial resources available to them than their more youthful counterparts. If the woman has been with her partner for a long time, their relationship may be more stable than shorter-term ones due to having to deal with a number of life situations together before having children. Older women who choose to become parents may have more patience. The maturity that comes with experience helps them to keep things in perspective. The likelihood of conceiving decreases as a woman ages. After age 35, fertility rates drop and by the time a woman reaches the age of 40, her chances of conceiving with her own eggs are approximately 24 percent. By age 43, the rate drops to 10 percent and waiting one more year sees the rate drop to less than two percent. Miscarriage rates are higher for older mothers. 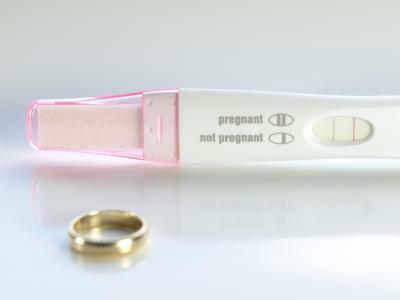 A woman who does get pregnant at age 40 has a 24 percent chance of miscarriage. At 43, the odds of losing the baby increase to 38 percent and go up to 54 percent when the mother is 44 years of age. Risk of birth defects increases with maternal age as well. A 40-year-old woman has a 1 in 105 chance of having a child with Downs syndrome. By age 44, the rate increases to 1 in 35, and a 46-year-old woman has a 1 in 20 chance of having a Downs syndrome baby. No matter what age a woman happens to be, there are pros and cons to having a baby. Deciding to delay parenthood may mean that plans for retirement will need to be put on hold due to increased financial responsibilities later in the parents' working life. For some women, this tradeoff is worthwhile since they feel they are better prepared to deal with the joys and frustrations that come with having children. If a woman finds that the expression "46 and having a baby" is one that she wants to apply to her, she should discuss her plans with her doctor. He or she can give her advice based on her personal medical history. It may be unlikely that she will be able to conceive without help, but it's not impossible. The doctor can refer the woman to a fertility specialist for a consultation and care. An option for women in their 40s who want to carry a child is to use donor eggs with In Vitro Fertilization (IVF). The specialist can outline the options available for each particular patient.